On August 4, 2011, Phoenix Police Officers James Spross and Nicholas Pittatsis attempted to contact Mike Alvarez, who was riding his bicycle in a Maryvale neighborhood. The officers did not know who Alvarez was as they were following him and he tried to evade them by refusing to stop and then riding onto the grass near the lake at Desert West Park. Eventually, Alvarez got off of his bike next to a home and Officers Spross and Pittatsis chased after him. Alvarez, who had fallen to the ground along the side of the house, turned over, pointed a revolver at both officers and opened fire. Officer Spross was grazed in the head and Officer Pittatsis was struck in the arm. They returned fire and retreated to the front of the house while Alvarez unlawfully entered the home and demanded that the resident inside provide her car keys. He eventually exited the house through the front door, still armed and as he advanced on Officers Spross and Pittatsis and gained entry into their fully marked Patrol Tahoe. Ultimately, Alvarez sustained multiple gunshot wounds and was transported to the hospital prior to being booked into the 4th Avenue Jail on a number of charges related to the incident. 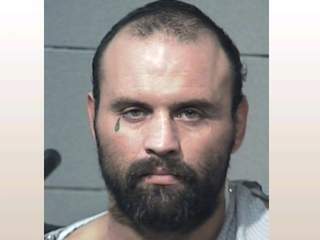 On Friday, April 19, 2013, Michael Alvarez was sentenced to 63 years for the attempted murders of Officer Spross and Officer Pittatsis by Maricopa County Superior Court Judge Kreamer.